Family Service Association has been providing early care and education services in Riverside county for over 25 years. We currently operate 10 child development centers throughout the county serving more than 1500 children each day. Our commitment to children and families led us to recognize the need for on-going professional development of those who work directly with children as well as support for those who are a child’s first teacher, their parents. In winter of 2000 Family Service Association held their first Child Development Conference. The Conference is dedicated to supporting early childhood professionals, parents, early childhood students, administrators, and others who work with young children in educational, medical and home settings. Each year we bring in recognized leaders in Child Development to speak to our participants about best practices as well as other topics of interest to those who work with and parent children. Workshops at this year’s conference include: Nurturing Children through Literacy, Intentionality in Action for Preschool Children, The Impact of Trauma in Early Childhood Development, Preventing Challenging Behaviors and more. Breakfast and lunch are included in the registration fee of $45.00. For more information about the conference or FSA CDC, please contact – Jessica Carrasco: Jessica.Carrasco-Salcedo@fsaca.org or 951-779-9623. This year we are excited to present two noteworthy keynote speakers: Theresa Covington, MPH, and Jennifer Jones, MSW. Theresa (Teri) Covington is the Director of Within Our Reach at the Alliance for Strong Families and Communities and has over 40 years’ experience in child health and safety. She is working to advance policy and practice recommendations at the federal and state levels from the National Commission to eliminate Child Abuse and Neglect Fatalities. Jennifer Jones currently serves as the Director of the Change in Mind (CiM) Institute at the Alliance for Strong Families and Communities. The change in Mind Institute, with funding from the Robert Wood Johnson Foundation serves as a hub for disseminating knowledge on the latest advances in neurosciences, providing training and technical assistance, and expanding opportunities for the transformation of organizations and systems as they adapt to the new application of the science. Other presentations at this year’s conference include a panel of professionals who work within different areas in child welfare (e.g., medical, education, social work, etc. ), a cultural factors presentation, two lived experience presentations presented by a former foster youth and father now parent partner who had an experience within the child protection system. Every year, the Children’s Conference is dedicated to supporting professionals, parents, social work students, administrators, and others who work with children and adolescents in educational, medical and home settings. Each year we bring in recognized leaders in child welfare and related professions, to speak to our participants about best practices as well as other topics of interest related to the well-being and safety of children. Continental breakfast, lunch, child care, Spanish translation services and parking fee are included in the registration fee of $30.00. The mission of the HOPE Collaborative is to promote the safety of children and to prevent abuse and neglect in Riverside County. This mission is accomplished through the coordination and facilitation of interagency collaboration; efforts to raise community awareness; education and training of professionals, parents, and the community; services to child abuse victims and families impacted by abuse and neglect; and advocacy efforts influencing public policy. 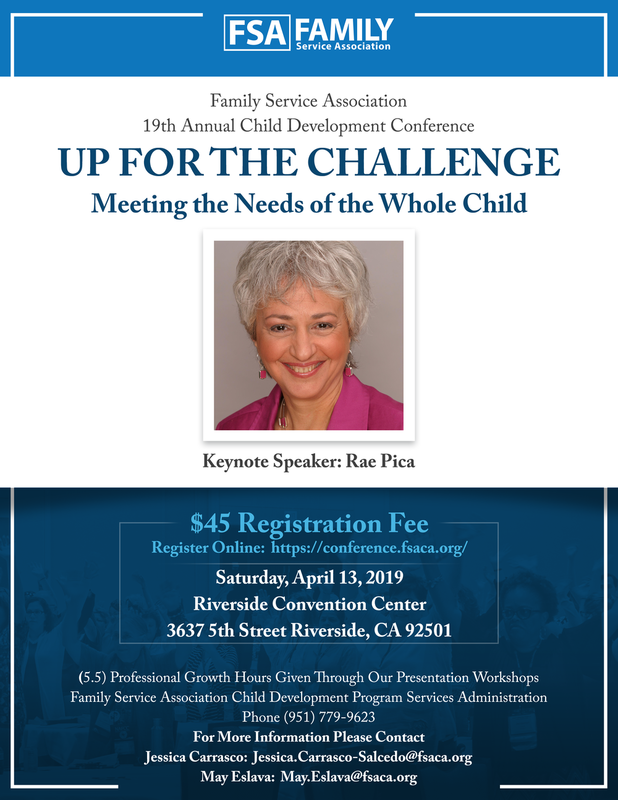 For more information about the conference or the HOPE Collaborative, please contact – Adrienne Rubio at (951) 686-3750 or at Adrienne.rubio@fsaca.org. FSA is proud to announce that its annual report is available to be reviewed online and downloaded for easy reading. Thank you to so many individuals and the departments who contributed so much effort in order to produce this report. In addition, we thank our Chief Executive Officer, Dan H. Hoxworth, for his relentless drive and vision to guide an incredible team of staff members to ensure this report is of the highest quality and accuracy. The report can be found at the top of the FSA website under Publications for download and at www.fsaca.org/theannual for a web friendly/mobile phone friendly scroll read. Family Service Association and Ashford University, an accredited online university, now offer all eligible employees savings on tuition and other educational costs. Ashford’s Tuition Benefit combines with Family Service Association’s tuition assistance program to provide employees and immediate family members with financial assistance to earn a college degree while working full-time. Visit success.ashford.edu/familyserviceassociation or call 855.805.6911 for more information. Select the link to sign up for the conference. HOPE for the Holidays is an annual toy drive for Riverside County foster youth. We coordinate with Regional Managers and Social Workers from Riverside County Department of Social Services (DPSS) to identify foster youth who could benefit from these gifts and fulfill them by various methods. From community donations at multiple donation sites throughout Riverside County to funds from district and city agencies, we aim to make sure all foster youth in Riverside County have a gift to open. Last year, the generosity from the Community Designation (CID) funds from Districts 1, 2, 3, and 5, My Stuff Bags Foundation, Blythe Energy, and the community who donated toys and other items, the toy drive was a success. HOPE staff coordinated with DPSS regional managers and social workers to identify foster youth who could benefit from the gifts. HOPE was able to gift a total of 805 foster youth throughout Riverside County. On November 27, 2018 FSA is participating in this year’s #GivingTuesday online campaign. Our goal is to raise $10,000. Donate and be a HERO to a Family! Ensure FSA's services are available to families in need by helping our giving go viral! You can leverage your gift and help FSA strengthen the community. Give Big and Give to FSA Senior Nutrition on October 30! Help us to continue to provide dignity, community and care to seniors. Family Service Association (FSA), a non-profit organization serving the social service needs of Riverside and San Bernardino Counties, has hired a new Chief Executive Officer. Dan H. Hoxworth will be joining the organization effective July 1, 2018.